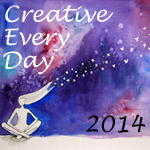 Ways to share: Once you've signed up, you can leave a comment on this post and/or use the "Mr. Linky" widget below to link to a blog post(s) or flickr image of your creative activities during the days of 6/2/14 - 6/8/14. Theme: June's totally optional theme is Green, which you read more about here. thanks for this opportunity, Leah! love sharing our creative work and knowing about yours! How fab that this month’s theme is “green” and inspires us to focus on nature because the past couple of weeks I’ve been painting & taking photos with just this in mind!! I’ve just written a blog post showing what I’ve been up to. Great theme especially for this time of year when the flowers are blooming and the trees once again clothed.